THROUGH MARCH 29: SILENT FOREST: RETURN. A film project by Adam Hogan that examines the interaction of industrial and commercial enterprises with delicate wetland environments in the Mississippi Alluvial Plain. 10 a.m. to 6 p.m., Monday through Saturday. Meadows Museum of Art, 2911 Centenary Blvd., Shreveport. Visit www.themeadowsmuseum.com. THROUGH MARCH 29: "OUT OF THE DARKNESS: REPRESENTATIONS OF MENTAL HEALTH." The exhibit is a juried art show with works that represent different types of mental health disorders. A closing reception and panel discussion is from 4-6 p.m., March 27. Donna Service Art Gallery, Bossier Parish Community College campus, 6220 E. Texas St. (Building A), Bossier City. THROUGH MARCH 31: VICTORIA SMITH. In the Emerging Artist Gallery. 11 a.m. to 5 p.m., Tuesday-Saturday. Bossier Arts Council, 630 Barksdale Blvd., Bossier City. Visit www.bossierarts.org. THROUGH MARCH 31: LIFE AND LEGACIES. This dual show features the legacy of Ed and Carol Allen paired with the reflection of the life of Julia Raring. Bossier Arts Council, 630 Barksdale Blvd., Bossier City. Visit www.bossierarts.org. 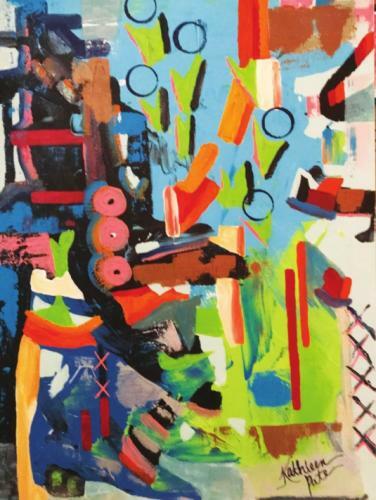 THROUGH APRIL 5: CREATIVE ART CONNECTION OF BOSSIER PARISH. The show will offer a variety of mixed media and artworks on canvas and paper in oil, acrylic, watercolor and pastel. Louisiana State Exhibit Museum, 3015 Greenwood Road, Shreveport. Visit www.laexhibitmuseum.org. APRIL 1-MAY 31: "DEPTH OF FIELD" A PHOTO EXHIBIT. Featuring the work of Maria Schmelz and Ron Austin. An opening reception is 6 p.m., April 5. Bossier Arts Council, 630 Barksdale Blvd., Bossier City. Visit www.bossierarts.org. APRIL 6: ART OF THE DOG. This reception is a collaboration between Rainforest Art Foundation and Robinson’s Rescue during the Downtown Pup Crawl. Suggested $10 donation. 5-7 p.m., Marlene Yu Museum, 710 Travis St., Shreveport. Call 717-9111. APRIL 6: ART OF THE DOG SHOW. Robinson's Rescue and Rainforest Art Foundation are collaborating to host Art of the Dog, a mixed media visual arts show. 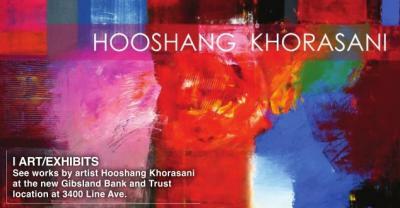 Artists' reception from 5-7 p.m. Marlene Yu Museum, 710 Travis St., Shreveport. Call 717-9111. APRIL 8: CREATIVE ART CONNECTION MONTHLY MEETING. Featuring an interactive meeting with a surprise activity. Free. 6-8 p.m. The Annex at Bossier Arts Council, 630 Barksdale Blvd., Bossier City. Call 549-1251. APRIL 17-MAY 3: LOUISIANA: A PARADISE FOR BIRDS. This photography exhibit is on birds by Dr. Charles Lyon. An opening reception is from 2-4 p.m., April 17. Louisiana State Exhibit Museum, 3015 Greenwood Road., Shreveport. Visit www.laexhibitmuseum.org. AGAVE: No cover. Happy hour Friday and Saturday, 5 to 7 p.m. 2-for-1 well, wine & draft. Haley Brooke, 6-10 p.m., March 28; Ambush, 8 p.m. to midnight, March 29, 30. Diamond Jacks Casino & Resort, 711 DiamondJacks Blvd., Bossier City. 678-7777. AMERICAN LEGION #14: Karaoke with Jay Couger or Dickie Turner 5:30 p.m. every Sunday; Flash Back Band, March 29. 5315 Lakeshore Drive, Shreveport. 635-8186. CELEBRITY LOUNGE: Safira Live Band Karaoke, March 28, April 11, 25; Big Daddy, March 29; Mayday by Midnight, March 30; What the Funk, April 4; Electric Circus, April 5; Night Shift Band, April 6; Southern Roots, April 12; DJ Konflikt, April 13; Soul Grooves, April 18; Mojiles, April 19; Super Fleek, April 20; The Wonderfuls, April 26; DJ Trentino, April 27. Eldorado Resort Casino, 451 Clyde Fant Parkway. Call 877-602-0711. 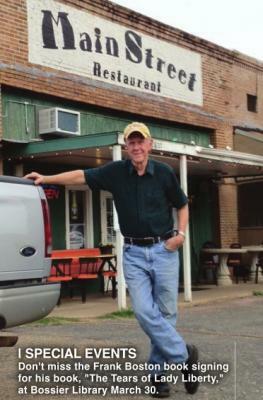 NICKY'S MEXICAN RESTAURANT: Wayne’s FM Karaoke, 6:30-10 p.m., Thursdays; Richard Cook, March 29. 2701 Viking Drive, Bossier City. 841-1345. 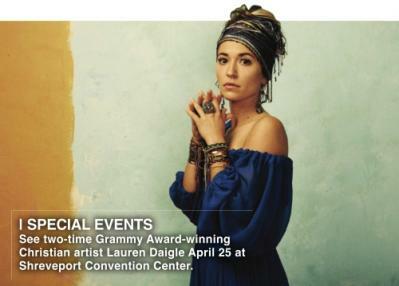 RIVERDOME: Rodney Carrington, 8 p.m., March 30; Dustin Lynch, May 24. Horseshoe Bossier City Hotel and Casino, 711 Horseshoe Blvd., Bossier City. 800-895-0711. THE STAGE AT SILVER STAR: Live entertainment. Gates open at 7 p.m. unless stated otherwise. Randy Rogers Band, April 5; Jordan Davis + Jared Mourad, April 12; Cowboy Mouth + Spectra Vamp, April 19; Parker McCollum, May 10. 1201 Dixie Overland Road, Bossier City. 752-3633. Tickets available at www.outhousetickets.com. SUPERIOR GRILL: Live entertainment on the patio from 6:30-10:30 p.m. Pseudo Boom, March 28; The Syndicate, March 29; Casey Martin Band, March 30. 6123 Line Ave., Shreveport. 869-3243. WHISKEY ROADHOUSE: Hours are noon to midnight Sunday; 6 p.m. to midnight Monday through Thursday; 4 p.m. to 2 a.m. Fridays and Saturdays. Karaoke from 8 p.m. to midnight every Tuesday. The Mix, March 28; Lee Mathis, March 29; Flashback 5, March 30; Sunday Funday with DJ Love, March 31. Horseshoe Casino, 711 Horseshoe Blvd., Bossier City. 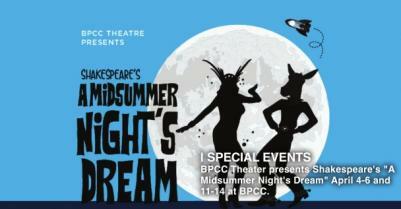 APRIL 4-6,11-14: A MIDSUMMER NIGHT’S DREAM. Though the story has been told countless times, Bossier Parish Community College’s unique twist on the time-honored tale is sure to entertain. $12. 7:30 p.m., 2 p.m., Sundays. Stephen W. Slaughter Theatre in Building C on the BPCC campus, 6220 East Texas St., Bossier City. Visit www.bpcc.edu. APRIL 6-7: THE WIZARD OF OZ. 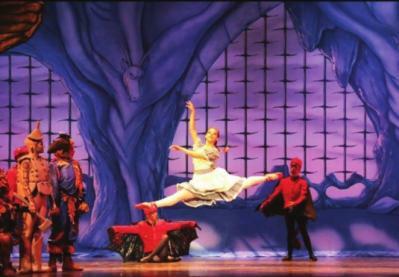 Shreveport Metropolitan Ballet brings its most popular spring production to the stage. $25, $35, $45. 2:30 p.m. The Strand Theatre, 619 Louisiana Ave., Shreveport. Visit www.thestrandtheatre.com. MARCH 28: CENTENARY WIND ENSEMBLE OUTDOOR CONCERT. This mix of Centenary students, faculty, staff and community musicians who have combined their talents to provide a full band experience for our community. A food truck from La Michoacana will be available. 5 p.m. Hargrove Memorial Amphitheatre, Centenary College, 2911 Centenary Blvd., Shreveport. Visit www.centenary.edu. APRIL 7: THE SPIRITUAL SIDE OF LES MISERABLES. Featuring the French musical’s beautiful songs about love, mercy, forgiveness and redemption, performed by veterans of musical theater and opera. $20. 3 p.m. Emmett Hook Center, 550 Common St., Shreveport. Call 225-397-6393. EVERY THURSDAY: DANCE CLASS. With Ivan and Vicky Bean. $8 per person. 7 p.m., beginner two-step; 8 p.m., beginner West Coast swing. Bellaire Fitness Center, 4330 Panther Drive, Bossier City. Call 949-4901, 678-3544 or visit www.shreveportbossierdance.com. THROUGH MARCH 29: SPRING BREAK LUNCH ON THE LAWN. Spread a picnic blanket on the grass and dine surrounded by the sight and scent of the Norton’s beautiful botanical gardens while the kids are on spring break with food trucks serving up treats. 11:30 a.m. to 3:30 p.m. R.W. Norton Art Gallery, 4747 Creswell Ave., Shreveport. Visit www.rwnaf.org. MARCH 30: 12TH ANNUAL SPRING FESTIVAL. Featuring Santa Cruzan parade and fireworks. 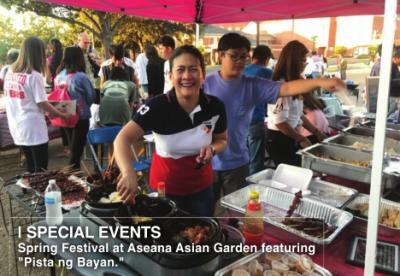 4-9 p.m. Aseana Asian Gardens of Shreveport, 800 Texas Ave., Shreveport. Call 401-8078. MARCH 30: BOSSIER CITY MAKERS FAIR. A celebration of handcrafted goods, artists, crafts and foods with over 100 markers and artisans with live music, activities and more. 10 a.m. to 6 p.m. Louisiana Boardwalk, 540 Boardwalk Blvd., Bossier City. Visit www.BossierCityMakersFair.com. MARCH 30: ARTINI 2019. The annual fundraiser for the Bossier Arts Council that celebrates art and area restaurants create signature martinis. $50-$65. 7 p.m. Bossier Arts Council, 630 Barksdale Blvd. Visit www.bosserarts.org. MARCH 30, MAY 11, JUNE 29, AUG. 24: TWIN CITY ROLLER DERBY. Watch them take on the Tulsa Roughnecks. $10, in advance; $12 at the door; $5 children 6-12; free for children 5 and under. 5 p.m., March 30; The Conroe Cutthroats, 6 p.m, May 11; Cajun Roller Girls, 6 p.m., June 29; The Capital Defenders, 6 p.m., Aug. 24. Bossier Civic Center, 620 Benton Road, Bossier City. Visit www.twincityrollerderby.net. MARCH 30-31: CADDO VELO CLASSIC. A two-day cycling event that will bring amateur and professional cyclists from across the country to Shreveport that benefits Feist-Weiller Cancer Center. The event features $20,000 in top prizes. Visit www.caddoveloclassic.com. MARCH 30: AUTHOR TALK AND BOOK SIGNING. Featuring "The Tears of Lady Liberty" by Frank Boston. This novel is an emotional, personal study of survival despite persecution under tyranny. 2 p.m. The Bossier Parish Libraries History Center, 2206, Beckett St., Bossier City. Call 746-7717. MARCH 31: 3RD ANNUAL MILES FOR MEALS 5K AND MOSEY MILE. An afternoon of running, music and family fun that benefits the Caddo Council on Aging’s Meals on Wheels program. $35, 5K; $15, Mosey Mile. 3 p.m. Caddo Council on Aging, 1700 Buckner St., Shreveport. Visit www.caddocoa.org/MFM19. APRIL 3: SPRING 2019 CAREER AND INTERNSHIP FAIR. Current students and alumni from all degree programs will be participating, and they will be looking to chat about part-time work, internships and full-time roles. $100, for-profit organization; $85, non-profit organization fee. 10 a.m. to 1 p.m. LSU Shreveport University Center Ballroom, 1 University Drive, Shreveport. Call 797-5062. 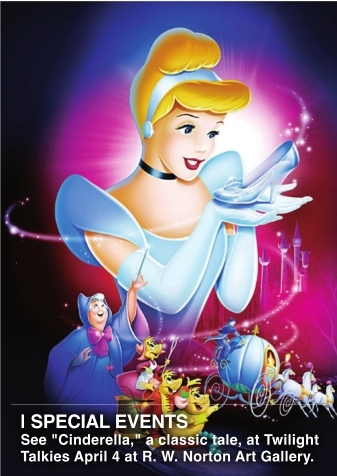 APRIL 4: TWILIGHT TALKIES: CINDERELLA. Bring your chairs and blankets and enjoy the movie under the stars on the lawn of the museum with local food trucks. 6:30, 7:30 p.m., movie begins. R.W. Norton Art Gallery, 4747 Creswell Ave., Shreveport. Visit www.rwnaf.org. APRIL 5-7: U.S. OPEN BOWFISHING CHAMPIONSHIP. The largest competition and biggest prizes in the sport of bowfishing. $300 entry fee per team of two to four persons. Live weigh-in at 9 a.m., April 7 at Bass Pro Shops Outdoor World, 100 Bass Pro Drive, Bossier City. Visit www.basspro.com/usopen. APRIL 5: SMOKIN' ON THE RED. A premium cigar event with cigars from 10 manufacturers, door prizes, food, drinks, music and more. Open to ages 21 and up. $59 pre-sale; $69 at the door. 5-9 p.m. Tobacco House at Eddie's Tavern, 1701 Old Minden Road, Bossier City. Call 861-7905. APRIL 6: DEFENDERS OF LIBERTY MUD RUN. Barksdale Air For Base opens its doors to the local community for this unique adventure race with military members through the four-mile, rugged wooden terrain of Barksdale’s east reservation with 19 military style obstacles. There is also a kids' race and activities for the entire family. 10 a.m. Warrior Training Center. Take exit 33 off I-20 (Haughton-Fillmore) and follow the signs. Visit www.barksdalelife.com. APRIL 6: SPRING PLANT SALE. The Northwest Louisiana Master Gardeners host this annual sale with a wide selection of perennials, shade plants, unique vines and fragrant herbs. 8 a.m. to noon. Randle T. Moore Center, 3101 Fairfield Ave., Shreveport. Call 698-0010. APRIL 6: PUP CRAWL. All dog lovers and their dogs are invited to this event with photos, pet adoption, food, drinks and art. 5-9 p.m., 500, 600, 700 blocks of Texas St., Shreveport. Visit the event page at www.Facebook.com. APRIL 6-7: 45TH ANNUAL MELROSE ARTS & CRAFT FESTIVAL. With more than 100 vendors featuring handmade items, tours of the plantation home, a children’s workshop and more. $5, adults; $2, children 6-12. $5 tours of the Big House. 9 a.m., April 12; 10 a.m., April 13. Melrose Plantation, 3533 LA-199, Melrose. Visit www.melroseplantations.org. APRIL 12-13: WOMEN VETERANS INFORMATIONAL SEMINAR. With keynote speakers, Secretary Joey Strickland, Louisiana Department of Veterans Affairs. All women veterans, active duty, Guard and Reserve are invited. Registration deadline is April 1. Free. 6-8 p.m., April 12; 8 a.m. to 3 p.m., April 13. Wyndam Garden Inn, 1419 East 70th St., Shreveport. Email womenveteransofthearklatex@gmail.com. APRIL 13: ARK-LA-TEX GENEALOGICAL ASSOCIATION MONTHLY MEETING. With guest speakers John Agan and Glenda Bernard. Free. 1-3 p.m. Shreve Memorial Library’s Broadmoor Branch, 1212 Captain Shreve Drive, Shreveport. Visit www.altgenealogy.com. APRIL 26: 2019 DANCING FOR A CURE. Annual fundraiser with local media stars dancing on stage that benefits Susan G. Komen Louisiana. $50. 7 p.m. Horseshoe Riverdome, 711 Horseshoe Blvd., Bossier City. Visit www.komenlouisiana.org. APRIL 27: 18TH ANNUAL DAVID RICE MEMORIAL ANGEL RUN & WALK 5K. Make a difference in the lives of individuals with intellectual and developmental disabilities while running and walking through the beautiful Long Lake subdivision in South Shreveport. Afterwards, enjoy fun for the whole family with live music, food, photo-fun, face painting, yoga, puppet shows, massage therapists and much more! $30- $40. Race begins at 8 a.m. Holy Angels campus, 10450 Ellerbe Road, Shreveport. Visit laholyangels.org. MAY 2: ANGEL FEST. Support Holy Angels and #GiveforGood with a celebration of music, food and friendship. Live music throughout the evening accompanied by tasty eats, refreshing drinks and familyfriendly activities. Free admission with a suggested donation of $25. 4-9 p.m. at Provenance Community in Shreveport. Visit laholyangels.org. MAY 4: CHILDREN’S BOOK FESTIVAL. Shreve Memorial Library hosts this family-friendly, literary event with children’s book authors and illustrators, costumed characters, fun games and activities for kids and food vendors. Free. 10 a.m. to 4 p.m. LSU Shreveport Campus, 1 University Place, Shreveport. Visit www.shreve-lib.org. DIAMONDJACKS CASINO & RESORT: 711 Diamondjacks Blvd., Bossier City. 678-7777. See Rewards Club for details. Restrictions apply. New Member. Receive up to a $100 refund in the mail. Mail offer based on play. Happy Birthday. Come in on your birthday, swipe your Rewards Club card and receive a present from us. $25,000 Instant Jackpot Giveaway. Win your share of 25K in cash and prizes! Win up to $5,000 cash instantly! Drawings from 7-10 p.m. every Friday. March Money Madness is every Friday and Saturday with drawing from 7-10 p.m. Win your share of 25K in cash and prizes! Win up to $5,000 cash instantly! 50+ Diamond Club is every Wednesday. LEGENDS BUFFET SPECIALS: Salute to our troops. 25% off every day at Legends Buffet. Must have military I.D. to receive discount. Not valid on holidays. Cannot be combined with any other offer. Seafood Buffet is Friday, $26.99 with Rewards Card. Prime rib and shrimp buffet, $24.99 Saturday nights with Rewards Card. $9.99 Thursday buffet with Rewards Club card. $7.77 Senior Dinner Buffet is every Wednesday for guests 50 years and older with five slot points. ELDORADO RESORT CASINO: 451 Clyde Fant Parkway, Shreveport. 877- 602-0711. March Promotions. $15,000 Progressive Cash Drawings is every Friday. Drawings begin at 8 p.m. Total prize amount is up to $3,000 per drawing date. $120,000 Roads to Riches Finale Drawing is March 30. Qualifying drawings begin at 6 p.m. Twenty guests win $500 cash, and one lucky guest drives home in a brand new Mercedes C-Class Sedan. April Promotions. $20,000 Super Slot Sundays is from 1-5 p.m. every Sunday. $20,000 Spring into Cash is every Friday. Drawings begin at 8 p.m. $95,000 Roads to Riches with Mystery Multiplier from 10 a.m. to 10 p.m. every Thursday. Play daily for chances to win cash and prizes. Earn entries into our June 29 Grand Finale Drawing. HARRAH'S LOUISIANA DOWNS: 8000 E. Texas St., Bossier City. 742-5555. Must be 21 years of age or older to participate. Return Rewards. Caesar's Rewards Members that earn 100 Tier Credits in a day will receive at least $5 in Free Slot Play. Mystery Reward Credit Multiplier is Tuesday and Wednesday. Caesar's Rewards members can swipe their card at the Promotions Kiosk to receive a Reward Credit Multiplier. Caesar's Rewards members have a chance to win up to a 100X multiplier. $15,000 March Mania Drawings is every Friday.